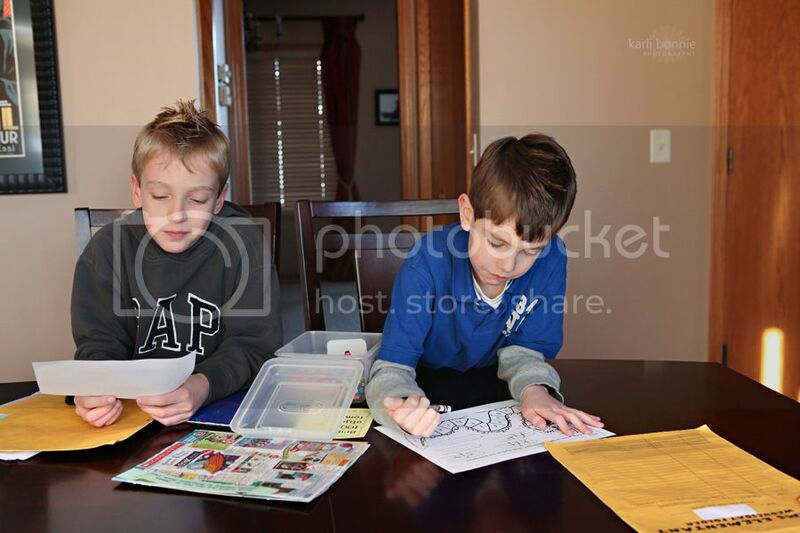 Everyday after school, the boys sit at the table, doing their homework. (Actually Drew doesn't have homework, but just go with it). Rays of sun beaming through the windows. A quiet, peaceful enviornment for learning. Oh wait...this is real life. That's right bubbies. Party's over. If this wasn't my second attempt of my Party of Three pictures this week, I would have taken Collin's embryology report away from the Tiny Tornado post haste. Unfortunately for Collin and his science grade...I was desperate. 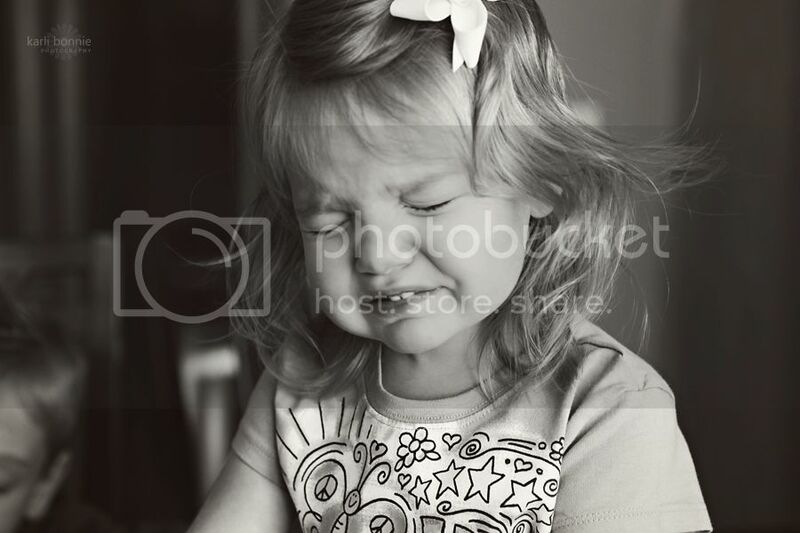 I can't decide which picture I want to choose for my shot of the week. I like the second one (you know, the fee fi fo fum one)...but I like this one too. Livia was certainly having a fantastic hair day. Am I losing your interest here? It's just so rare for me to get all three faces in the same frame. OK, I have a zillion more pictures, so I'll just wrap it up. In a nutshell, I started waving an M&M around...the Tornado started shrieking "have it! have it! have it!" while waving her little wrist around in a circle; you know, the usual. In unrelated news, below is a before & after of a new action I've been working on creating. From the girl that knows how to do like five things in Photoshop...creating an action - LOL! It's supposed to be kind of vintagy, hazy...but you know me. I think my editing style is fairly subtle. You can see the difference, right? By the way...the right side is my edit - ha! Whew! Five weeks down, whatever 52 minus 5 is to go! I'll say it again...I can't wait to get these kids outside for their weekly picture. Actually, I can't wait to get outside in general. How about you? LOL! My daughter wants to know if they have those shoes in a womans 8. She's squealing over the shoes. These photos are SO fabulous. (And how on earth is your house always so clean). LOVE the fact that the boys just keep going like she's not even there. HA! I love the second picture, too! I love that second photo. What great shoes for her. I found your blog about 2 weeks ago and I am truly enjoying it. You are so entertaining! I think your blogs is one of my favorites because I kind of drift away into your humor and adorable pictures of your kids and then of course I soak up some inspiration along the way! Your daughter is such a crack up and what a heart breaker she is gonna be...well, all of them for that matter;0. OMG Love her cute shoes!!! 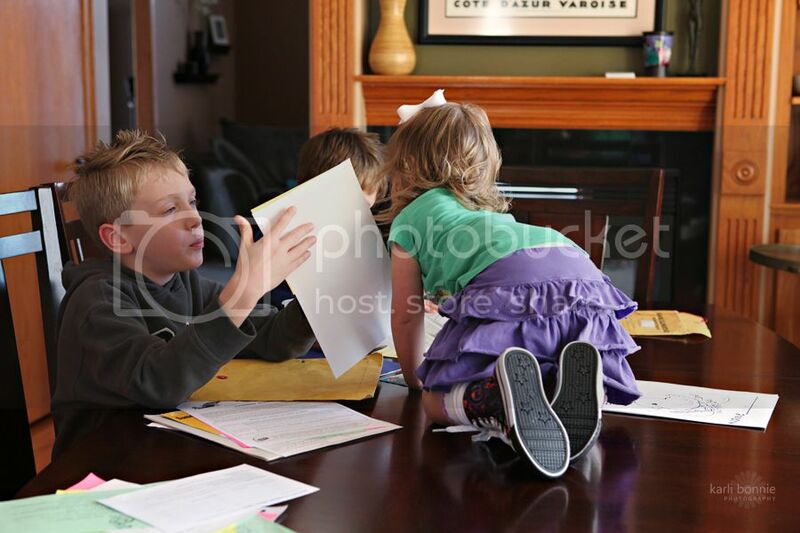 I wish I could pull photos off this well of the three of my kids. This group of photos is just too cute!!! #2 and #4 are my favorite, but each picture has its own appeal. These are really fun! The 2nd one down? If I'd had coffee in my mouth? You would have owed me a keyboard. Fantastic group of photos/captions; LOVE them ALL! Love that hazy vintagy action too & if I had big boy ps, I'd make you give it to me for free! As for getting out, we are dying to! It's been nothing but snow for us, day after day, and Georgia is driving me batty! 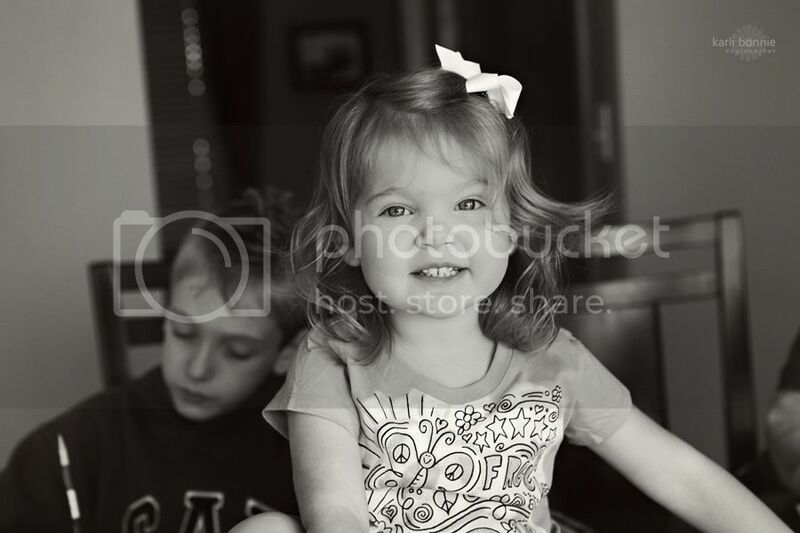 Terrific photos, adorable subjects! I WANT THOSE SHOES!!! Wonderful photos. 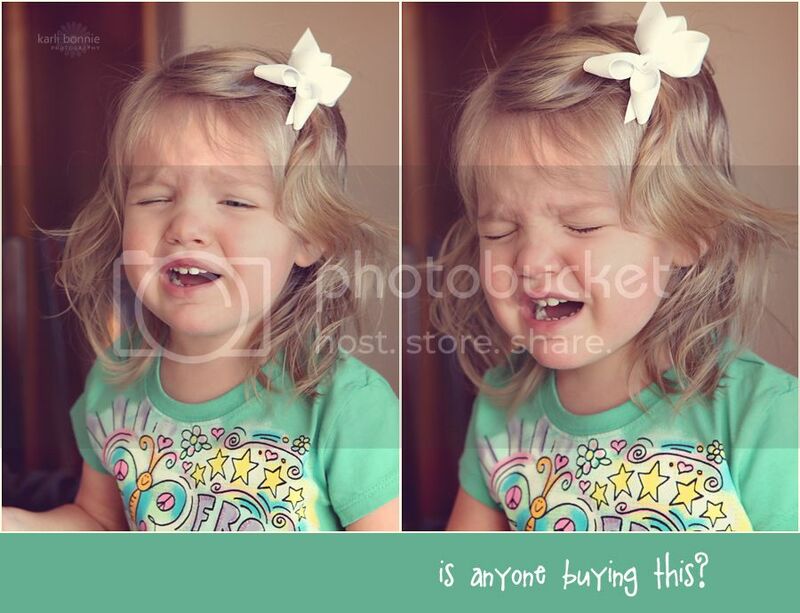 I love the second photo! I love her shoes and outfit it's SO freaking adorable. Its cute when kids play together! Wow, you take some stunning photos!!! Love Love and totally loving those rockin' shoes!! Number 2 is my favorite!! Oh I love it!!!! Maybe it's because I have 2 older brothers and was always in their business too. Yes I too was a tornado! Wonderful photos, wonderful commentary: another home run for you!! These are so cute! The last few are hysterical! Okay Karli, love these. Fantastic. 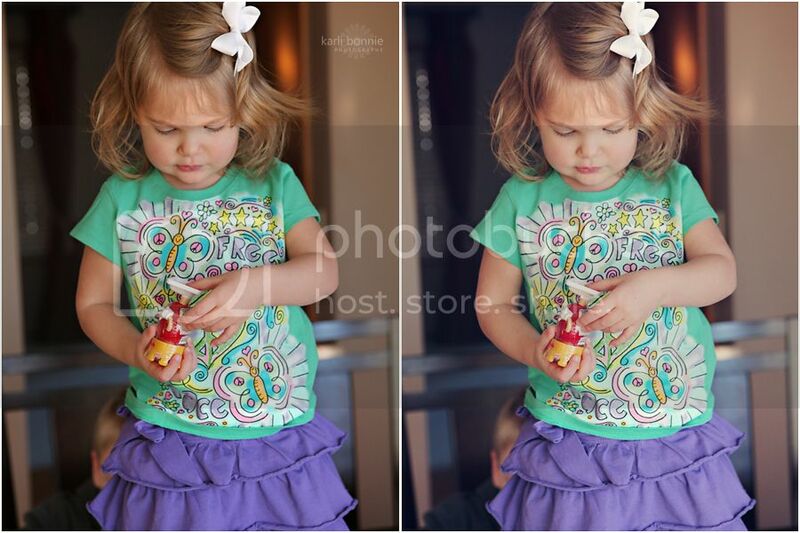 Ohhh this post made me smile :) Livia is just so so cute! i LOOOVE the little bow she has in her hair - divine. I love how you have captured these fantastic moments, I really like the tantrum one if that helps but they are all great! Oh my goodness! So adorable, love it! I lover her little sneakers, so darling. Haha, these are great! Love the "proofreading" one! Wow Tornato has some big feet. Love those hightops. Again you made me laugh I love your kids. I think the one with them all looking or doing something with the pencils may be a neat one. I love your creativity as you share these with us. haha... this is so precious! I think I've said it before, but I love your posts (and photos of course). Oh, you are so awesome!! 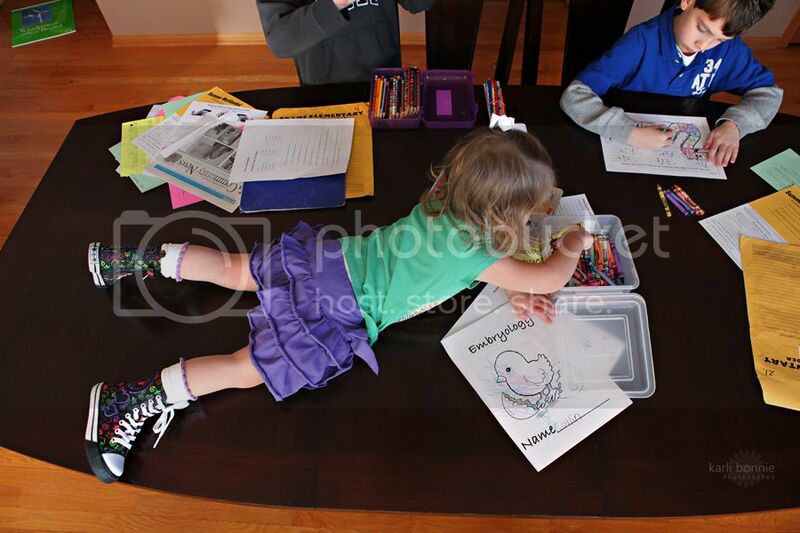 Letting TT mess with homework just for the sake of a photo-op!! Love it!! lol!! Why can't you do a collage of your top 2 favs for your 52 weeks?? Both shots are very worthy! And nope, I ain't buying her tears! They were big crocodile ones, right?? lol!! Sorry I'm late to the game (last weekend traveling for a while, I pray!!) but as always, your words and your kids make me smile!! Oh, and I'm adoring that action -- so subtle, and just right! 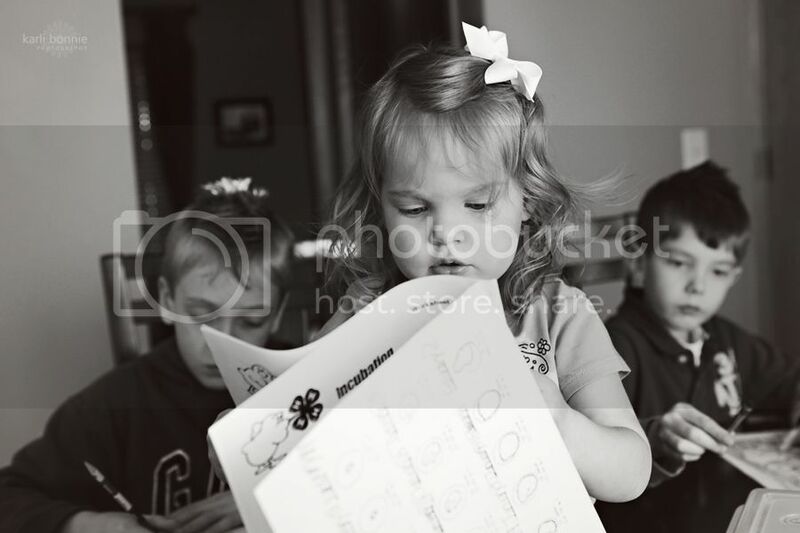 I like the photos where Livia looks like she's reading. Very cute and great composition. And yet another fabulous post my friend! I really look forward to reading your blog every week. Great pictures and great commentary. I can't believe how long Livia's hair is getting. She's just beautiful. Amazing photos as always!! ANd yes, I am going stir crazy - I can't wait to get out of the house - I can't wait for spring!! I can't take it. This is a great post!! I LOVE the Dun Dunnnn.... one! So funny! Okay, when I saw your first photo I was like, "I don't think so, where is she?" because as you know we have one just like her here. That was stinking hilarious! I'll be visiting here more often friend. Love it! Oh Funny! My friend sent me over to you because she thought my Bo might fit into your gang :) He is a little handful himself :) Gorgeous pics! Look forward to see more! Oh my goodness gracious - how did I miss this post? I LOVE LOVE LOVE it! 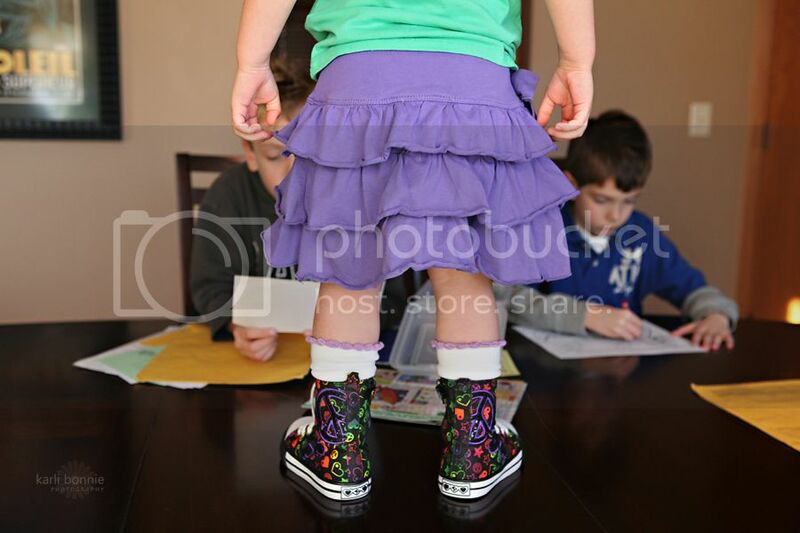 Ok, the one of Livia's backside - her ruffled skirt and adorable high tops is out of this world! Keep on posting girlie - precious!!!! Cute pics. I love her sneakers. Love your blog! I have three little boys, that are so awesome! 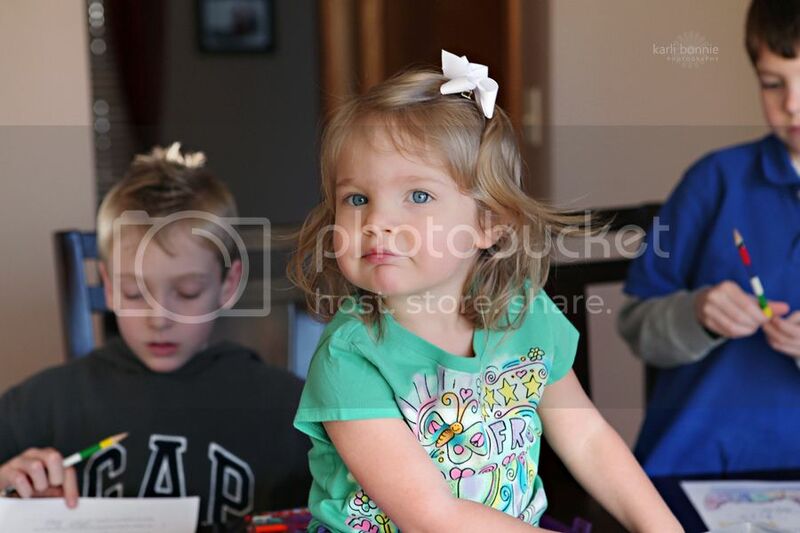 But looking at your darling daughter made me melt... especially in those cute purple sneakers :) Great pics!